Thursday night at Market Hotel was a night for survivors. Both the artist and the venue are inextricably intertwined as crucial parts of last decade’s Brooklyn DIY scene, but both have reshaped and reformatted themselves for the future. Titus Andronicus survived the meat grinder of the music industry and a myriad of personnel changes, and now find themselves having landed peacefully into the arms of the excellent Merge Records. The most recent Titus record, 2015’s The Most Lamentable Tragedy was perhaps the band’s most ambitious and fully realized record. The Market Hotel meanwhile has itself survived a laundry list of issues but Market v3.0 began again in November and the limited calendar will soon give way to a full-on slate of shows in the New Year. 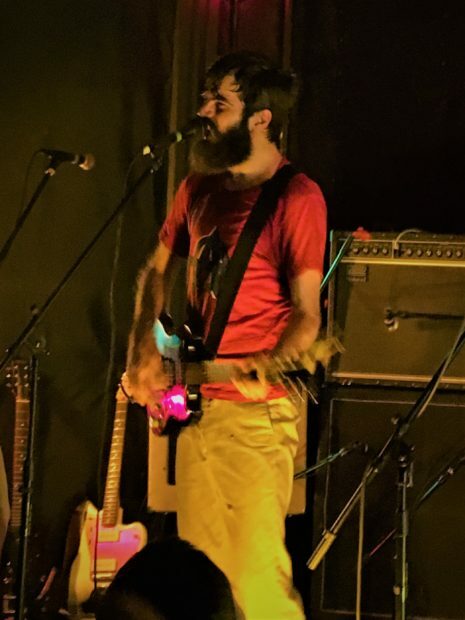 This year saw Titus Andronicus in retooling mode, and this Market Hotel show was the only headlining Titus gig of the entire 2017 calendar year. But Patrick Stickles seems to be in a very good place personally, as his positivity on this night was palpable. When the doors opened, the band members were seated at the merch table to greet the fans, and Patrick spend the better part of the first hour of the night meeting and greeting and catching up with old friends. The fan friendly theme bled directly into the performance itself, as Titus delivered a nearly two-hour set — representing the longest set ever played at this venue. The setlist contained a panoply of Titus material, from their very first single all the way through a good chunk of the recent albums. Throughout the show, Patrick noted members of the audience, thanked the people who have helped the band throughout the years, and played his heart out. The crowd for their part were fully engaged — there were no chatterers, just people singing along with the anthemic lyrics from the front to the back of the venue. By the time the set ended with a fantastic punk-tinged cover of Springsteen’s “Glory Days”, the crowd, the band, and the venue had proved that its all about survival and fighting through life’s conflicts to emerge on the other side stronger than ever. We expect that 2018 will be a very good year for both Titus Andronicus and The Market Hotel, and this show gave us great hope for the future of both. I recorded this set with the installed microphones along with an excellent feed from house FOH Eric. Other than one point near the end of “Perfect Union” when a drum mic shorted out, this recording is quite excellent. Enjoy! In 2016, JEFF The Brotherhood is the perfect band to play Market Hotel. Both the band and the venue are survivors of the early years of NYC DIY and after JEFF spent some time in major label land and Market reconstructed after a 2010 closure, both are back this year better than ever. JEFF’s new album Zone harkens back to their earlier work — 70s-influenced party/stoner rock with songs that are about carefree days of youth. This Market Hotel show took place last month on a Tuesday night — the first of three consecutive mid-week nights on the venue’s schedule in the final week before the ramp up to a full liquor license and a full calendar. JEFF’s draw in Brooklyn was strong enough to fill the place on a school night and the band was thankful in acknowledging the crowd size and its participation level. The band played a heavy dose of Zone material, but also relied on a nice mix of older songs including an epic nine-minute version of “Whatever I Want” to close the night. With the frenetic crowd, the M Train passing by the panorama windows, and the Orrall brother ripping through this classic number, all seemed perfect for a moment in Bushwick. We’re hoping their are many more nights like this with JEFF gigs at Market. JEFF The Brotherhood just returned from a tour of Europe and will have selected shows in the South through November and December, dates HERE. I recorded this set with the mounted AT mics mixed with John’s excellent feed. The room sounded really excellent and the crowd level of excitement led me to favor the room mics in this mix. The sound quality is superb. Enjoy! YVETTE owned the stage on this night at Market Hotel, preparing the crowd for HEALTH with their enveloping, dark, and percussive sound that seems like it won’t let you go. Since 2013’s Process we’ve seen YVETTE grow and evolve as a band, as they’ve continued to gestate new material before rapt live audiences. Between our Hopscotch encounter with them in 2014 to a Trans-Pecos show in 2015, they’ve continued to develop new and exciting ways to get under our skin, including a couple of new songs on this night that we hadn’t heard before (one so new it lacks a title). Likewise, the Market made sense for this band and the one it followed, with the room’s layout literally narrowing the focus to the lone duo up front, backlit and relentless. Noah Kardos-Fein and drummer Dale Eisinger have always maintained a certain economy to their shows, foregoing most chatter in favor of weaving their set into a continuous flow. It feels like time for a new record, which they’ve continued to work on, especially as Process predates Eisinger’s time in the band. We can’t wait to hear it. I recorded this set with the mounted AT 4051 cardiods an a flawless soundboard feed from house engineer Jason. The sound quality is excellent. Enjoy! 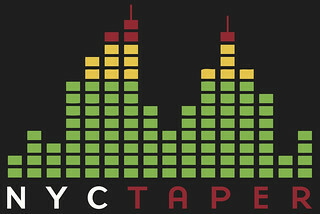 If you Download this recording from NYCTaper PLEASE SUPPORT YVETTE, visit their website, and purchase Time Management and their other releases from Godmode Records[HERE]. Its been a very discouraging year for forward-looking people. Tonight begins the tacky celebration of the nomination of a vulgar racist xenophobe of a major political party for President of the United States. Its as if for the next three days, forty percent of the country will be giving a massive middle finger to people of color, and anyone with a conscience and a sense of justice feels helpless. The question then becomes what can we do. If you’re a group of young multicultural people from Providence Rhode Island, you form a punk band with a message — that hatred and xenophobia are things of the past and we, a “bi bilingual political dance sax punk party” are here, and we are the future. Downtown Boys are certainly a breath of fresh air in this toxic world. The band’s themes of inclusion and acceptance within the realm of punk (with a sax!) isn’t particularly a new idea, but add in bi-lingual lyrics and LGBT elements, and the idea of the perfectly integrated musical act becomes closer to realization. That the band executes their message with energy and commitment makes their music all the more compelling. The Downtown Boys show at Market Hotel was one of those nights that won’t soon be forgotten. The band’s increased popularity brought out a truly diverse crowd, and given the Market’s goal of providing a community of musical performances of diverse styles and backgrounds, the band represented an inspiring coupling of ideals. In 2015 Downtown Boys signed with the most excellent Don Giovanni Records and released Full Communism to universally positive reviews. Its an encouraging development for the band that their call for human rights is reaching a larger and more accepting audience. At the Market, the set saw the performance of most of Full Communism, a few older tracks, and what I believe are six new songs that hopefully portends a 2016/2017 new album from Downtown Boys. Downtown Boys return to NYC for a show at Studio at Webster Hall on September 16. I recorded this set with the installed AT mics mixed with an excellent board feed. The sound is live and raucous and in the moment and totally excellent. Enjoy! “A Day at the Market” is really a simple concept for an intimate performance in a quintessential setting. Some of our favorite performers will play the Market Hotel during the daylight with unamplified acoustic guitars in front of a select audience. The first installment of what we anticipate will be a long-running series featured the inimitable Ryley Walker. This show took place on a Friday afternoon, and as you can tell from the rumbling train and siren audible early in this recording, the Market Hotel’s unique location was very much a part of the proceedings. And that’s how it was intended. One of the charms of this unique venue is the placement of the huge window behind the stage that makes the audience feel as if the performer is playing virtually on the J/M Myrtle-Broadway subway platform. And the intimate nature of the event made it easy to understand why we selected Ryley Walker for the debut of A Day at the Market — his immense talents and likeability are quite intense when it feels like its just you and him in the room. Ryley played all new songs at this event, offering us a preview of his new album Golden Sings That Have Been Sung, which will be released on August 19 on Dead Oceans Records. Of the nine songs on the album, six were performed (along with one unreleased track). Ryley was accompanied only by stand-up bass player Anton Hatwich, so that these are pared-down versions of the new album and this recording is a fine accompaniment to the official release. More great news to report — Ryley Walker will return (with full band) to the Market Hotel for a proper night time show on November 3 and tickets are now available [HERE]. I recorded this set with four strategically placed microphones. I utilized the installed audio technica cards mounted in the center of the room combined with two schoeps cards on a stand in the front of the stage. While obviously the wholly acoustic setting allowed for the ambient sounds to be heard, overall this recording is exactly how it should be — full spectrum clear sound of a special event in a special setting. Enjoy! At some point, when we can figure out how to properly edit it, we will have a complete upfront video from this show. Sorry no downloads of this one. This recording is now available to Download in FLAC or MP3 or to Stream at Archive.org [HERE]. There’s much love for the band Real Estate both at this site and in NYC in general, but that doesn’t mean everyone’s a fan. With the detractors, it seems that what bugs them the most is that Real Estate make things too easy — their music seems to positively roll forth from them in a smooth wave, with breezy melodies and approachable hooks, vocals wafting in a comfortable haze. That voice comes from one Martin Courtney, who rolled out a solo effort, Many Moons, last year. It’s what you hope for in a solo album — a scaled-back version of a Real Estate album in some ways, a much more personal, intimate album in others. If you don’t like Real Estate, well, I don’t know what you to tell you, because Courtney doesn’t abandon the band’s formula so much as peel back a few layers. “You will not find me wasting my energy” begins one couplet on the album’s opener “Awake,” and you get the sense with this record that it’s not a lack of effort by any means, but it is a great example of not trying too hard. Courtney hit that sweet spot at this recent Baby’s All Right show, a venue which at this point feels like a second home for a certain caste of Brooklyn music regulars. This performance, falling near the end of the tour, had the mellow, easy feel of a weekend show before a friendly crowd. We got to hear the entire album, highlighted by the single “Airport Bar,” and the kickoff track “Northern Highway.” Of course, it wouldn’t have been a show by a Real Estate band member without some crucial covers, and Courtney nailed both the placid “Harvest Moon” and Echo and the Bunnymen’s “The Killing Moon” before the grand finale, with opener EZTV joining the headliners for a Feelies cover, “On the Roof,” from their second album The Good Earth. It was a night for the familiar, a night for the good, and one for a longtime friend to share with the people who were with him from the beginning. The engineer Jason Kelly of Baby’s All Right recorded and mixed this set. The sound quality is outstanding. Enjoy! Support Martin Courtney at his website and by buying Many Moons from Domino. Sometimes adversity breaks bands; other times it breeds strength. 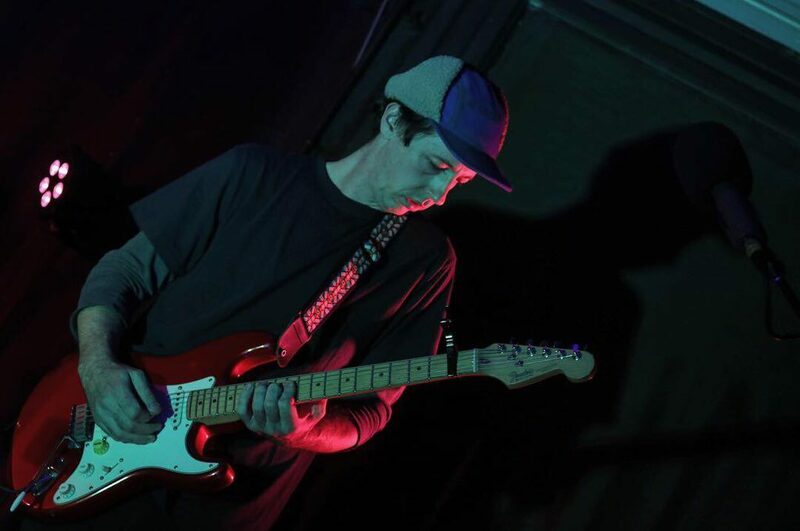 The Soft Moon have had more than their share of travails on this tour, the most notable being that they got robbed during their West Coast leg, leaving them with no gear or merch for the rest of the tour. Fans stepped up via their GoFundMe page, and they were back on their way bowed but not broken. Visibly frustrated, the band faced a choice — call it a night, or plow ahead. With almost nothing technology-wise on their side, they chose the latter, giving the crowd who’d braved sub-zero temperatures a memorable, hard-charging set that channeled frontman/creator Luis Vasquez’s rage into the conduit of their songs, dark, synth-driven postpunk dirges whose disaffection no doubt matched Vasquez’s actual mood. The band’s latest album, Sleeper, is arguably its best, and we got a fine sampling of those tracks, including “Black,” “Wasting,” and “Wrong.” The new record’s added depth was evident on the electropop pleaser from that record, “Far,” in particular. 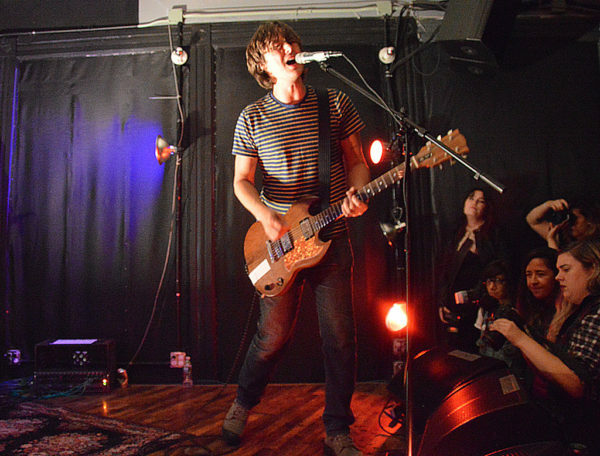 Among the several performances of theirs we‘ve covered, The Soft Moon have never failed to draw a large crowd, and to draw them in once there, and this show continued the theme. Vasquez is a natural to watch, contorting his body as he belts lyrics that are often buried under effects. Fans crowded around him under the red stage lights, right in the impact zone for the sound system’s deep bass to catch them up in the whirlwind onstage. Once the sound was on track, so were The Soft Moon, and Vasquez was unrelenting for the rest of the set — perhaps afraid to pause too long. The crowd stayed with them, right through the pummeling encore of “Die Life,” “Want” and a new(?) track. The Soft Moon didn’t get to have a perfect night, but they can count this as another good one for those of us on the other side of the stage. For a second shot at seeing the band, come to Baby’s All Right on Feb 18. I recorded this set with a soundboard feed of Dana Wachs’ house mix, coupled with Audio Technica microphones mounted in our usual spot in the venue. Other than the general sound system issues, which we’ve removed, the sound quality is quite good. Enjoy! The Soft Moon have upcoming shows in Philadelphia on Feb 16, New Haven Feb 17, at Baby’s All Right in NYC Feb 18. See all their tour dates here. Support The Soft Moon — buy their records from Captured Tracks, visit their website, and support them via their GoFundMe page.